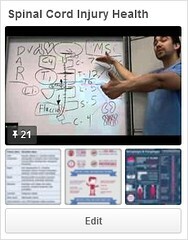 Click Here — Learn more about respiratory management and watch thousands of SCI videos on SPINALpedia! My respiratory issues were intense when I was first injured. I was on a ventilator for six weeks and had a tracheostomy (tube through the skin of my neck to my lungs) tube for three months. 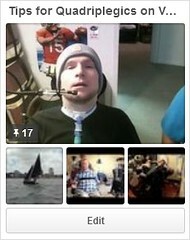 My family and I were told early on that I was never going to get off the ventilator. I had two episodes of pneumonia when I was in the hospital. For months I had to have chest percussion every few hours to help remove the secretions from my lungs. The secretions from my lungs had to be suctioned with an instrument through my trach tube. Through hard work and breathing exercises I have been able to strengthen my diaphragm. I now have very few respiratory issues. During FES (functional electrical stimulation) of my legs I actually get a cardiovascular workout and breathe deeply. I still can’t cough well on my own. I need someone to give me a quad cough (push on my lower abdomen) when coughing up mucus. I use an abdominal binder when standing now that I am stronger. I used to use it full time in my wheelchair. The standing frame has helped me taper off of the need for an abdominal binder in the wheelchair. What level of SCI are most likely to have respiratory issues? C5 and above usually have the most pulmonary problems. They might require a breathing machine or a trach tube because the diaphragm and other muscles that help with breathing are not functioning with the brain to maintain proper breathing and air movement. Some patients who start out on a breathing machine are able to breathe on their own as the inflammation in the injured area decreases. It takes up to 6 months for the inflammation to totally disappear. Do not be discouraged if you require breathing assistance right after your injury. Many quads do get off of the breathing machine after they have survived the first few months. Those months are all about surviving. 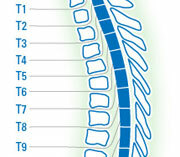 Any injury above T1 will reduce the strength of your intercostal muscles which are located in between your ribs. They are used for coughing and deep breathing. Focus on daily breathing exercises and quad-coughs are needed for coughing. 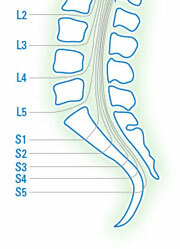 An injury above T12 will still have problems with the strength of abdominal and intercostal muscles. Always keep breathing exercises as a part of your regular exercise regimen. You can electro-stimulate your abdominal muscles to strengthen them which will help with all aspects of breathing. What steps are there for treating respiratory problems? Increasing breathing exercises. Do the exercises every two hours. 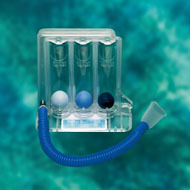 There is an incentive spirometer that can measure your improvements. 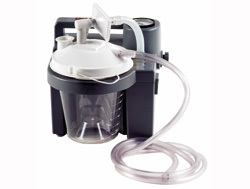 Voldyne 5000 Volumetric Exerciser“Features:• Voldyne 5000 Volumetric Exerciser – Capacity: 5000ml. • Large volume measurement and advanced low-work-of-breathing filter. • Compact, ergonomic design with built-in handle. Helps to open up the capillaries of the lungs. Used to strengthen and to keep the lungs healthy. Check with your respiratory therapist to develop the best program for you. Airway clearance devices are used to clear the airways of mucus for the purpose of improving breathing and decreasing the chances for respiratory infections to develop. 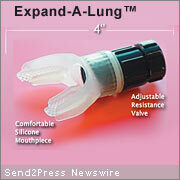 These airway clearance devices are critical to the maintenance of many lung diseases. This portable electric device utilizes a blower and a valve to alternately apply a positive and then a negative pressure to a patient’s airway in order to assist the patient in clearing mucus. Air is delivered to and from the patient via a breathing circuit using a flexible tube, a bacterial filter and either a facemask, a mouthpiece, or an adapter to a tracheostomy or endotracheal tube. 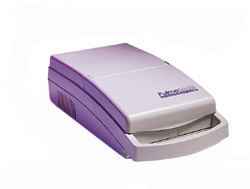 These small, handheld devices provide positive expiratory pressure (PEP.) Exhaling through the device creates oscillations, or “flutter” in pressures in the airway. This fluttering helps to loosen the mucus. 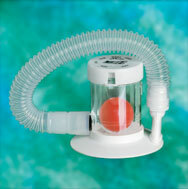 Other PEP devices are used with a small volume nebulizer, and operate in conjunction with medication delivery. IPPB use pressure to passively fill the lungs when a breath is initiated. An incorporated manometer and mechanical valves serve to end the flow of inspired air when a predetermined pressure is reached on inhalation. 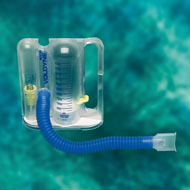 IPPB breathing circuits are designed to nebulize inhaled medication. Most IPPB devices are powered by compressed air and are not suitable for home use. Known as high frequency chest compression (HFCC), ThAIRapy Vest is worn like a vest. It works by vibrating the chest wall, loosening sputum, then chest wall oscillation causes outward airflow, similar to that of a weak cough.